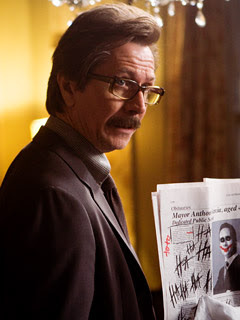 Home » batman , gary oldman , movies » Gary Oldman sez: Third Batman movie shoots next year! Gary Oldman sez: Third Batman movie shoots next year! Awesome news coming out of Comic-Con in San Diego: Gary Oldman - who plays James Gordon in Christopher Nolan's Batman movies - was asked during a panel about his upcoming movie The Book of Eli about when the next Batman film would begin filming. Oldman's reply was surprisingly open (read that as: he was encouraged to let it slip by The Powers That Be): "We start shooting next year, so we are at least two years away. But you didn't hear it from me!" So that potentially puts the next chapter of the definitive Batman film saga with a release date of 2011. Until then, I guess we just keep watching The Dark Knight: a film so overwhelmingly good that I couldn't bring myself to write a review of it. But if that movie was any indication, I suspect that the next installment is going to ramp up the "escalation" and start bringing in a lot more freak villains to Gotham City... and ironically, Gotham will come to realize that it has no other choice but to turn to Batman for help.